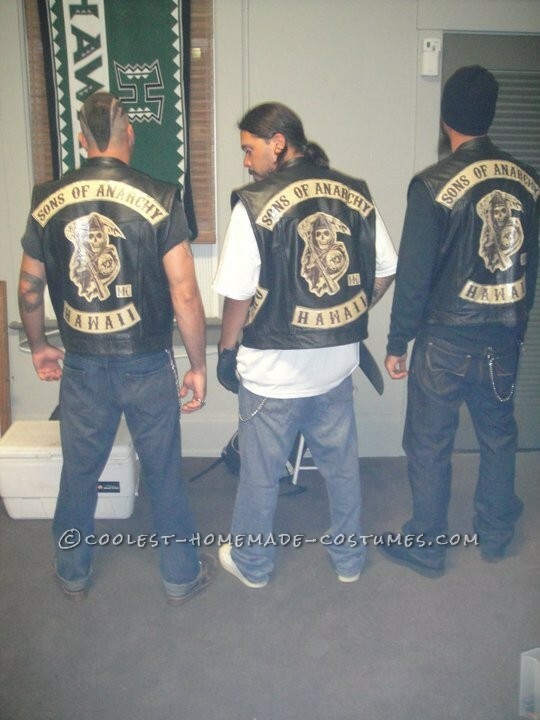 Had everyone get all black leather vest ( you can always get a black sweatshirt and cut the arms off and cut down the middle front to make it like a vest style). Then grabbed beige stiff material and iron-on heat T-shirt transfers. 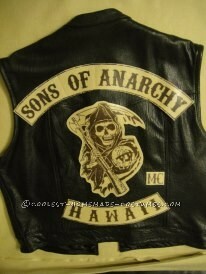 Cut and paste from the internet the Sons of Anarchy symbols to make a word doc. that can be printed on the transfers. Doesn’t need to be in exact place on the transfer since you will cut after you iron on the transfers. Once symbols are printed on the transfers, then iron the transfers on the beige material. Cut like a patch and stitch on to the vest. Just add jeans and white or black shirt and bikers look there you go. Dont forget to accessorize with chains and rings, my boyfriend used some of mine, that was fun. Caution: Getting the correct size print for the jactet took some practice so print on regular paper first then use your T-shirt transfers. (Even cut the paper out to visually see if that is the size you want the patches to be) Also, when ready to print on your transfers make sure you change your printing settings to T-shirt tranfers which can be found in the preference section then change the paper to T-Shirt tranfers and the document will flip itself for ironing (like a mirror). Do a test run on regular paper once printing settings is changed to completely make sure its correct. Easy part: Once you figure out the size you want to make the patches the rest is easy. Cut and then either sew or some of my friends used a staple to hold down the patches. REMEMBER…Printing options needs to be changed to T-shirt transfers which is normally under the type of paper you are using! How did you get the images for the patches?